"Yvette Mimieux as the glamour girl of the future... there was nothing wrong with her dimensions!" They don't make radio ads like these any more. And you can hear them for yourself right here. 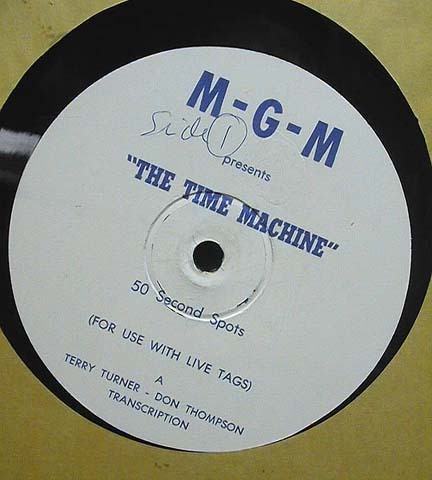 Terry Turner and Don Thompson created eight 50-second radio ads for "The Time Machine" and eight twelve-second ads. These were distributed to local theatres for promotional use via a 16" transcription disc. Theatre owners would, in turn, provide the spots to radio stations, with instructions for the station announcer to add a "tag" of local information - play dates, times, theatre name. Ten seconds could be added to the fifty-second spots, to make a full minute, and three seconds could be added for a brief tag to make the twelve's into fifteen second spots. Basically, you've got two voices and whatever sound effects happened to be in the library; the spots actually do the film a disservice. What they could have sounded like is suggested by the following "sweetened" version of the same spot heard above, here in a "remix" version created by adding eight tracks of sound effects and music from the film into the original. The resultant spot is something might be likened to a "colorized" version of a black and white movie.